The retirement of David Coulthard at the end of 08 paved the way for the raw pace of Red Bull's starlet Sebastian Vettel who had impressed hugely whilst at the wheel of the Toro Rosso. We all know of the arguments that ensued at the beginning of 2009 when BrawnGP, Toyota and Williams had exploited a loophole in the new rules to use Double Decked Diffusers. This led to those teams having an advantage at the start of the season whilst the others went off to redesign their own iterations. Red Bull were one of the teams that lobbied for the DDD's to be banned as they knew that implementing it on the RB5 would lead to a compromised design. This was firstly blamed on the introduction of pull rod suspension on that years challenger which lowered the centre of gravity but was said to encumber the airflow to the DDD if applied. The pull rod suspension was not the only reason that using the DDD on the RB5 would be difficult the design of the gearbox which was also lowly slung was also essential in how the airflow path utilised the top deck. Brawn GP had been eager to use the Carbon Fibre casing designed in the Honda days in the BGP-001 to this end. Even without the DDD it was clear the RB5 was the best of the Newey designed Red Bull's thus far with the teams first 1-2 coming in China. The car featured elements not seen on other designs with a ridged nosecone and extremely sculpted Sidepods that left the exhaust to exit just under the upper wishbone. Newey and the design team also took the wording around the Rear Wing Endplates and Diffuser to it's usual limits by extending the Endplates down to form part of the Diffuser. The diffuser stole the limelight in 2009 which clouded the effects seen by both mechanically and aerodynamically by the switch to slick tyres. The reintroduction of slick tyres was just one of the measures both the FIA and TWG believed could reinvigorate the wheel to wheel racing in F1. Tyres are the unsung heroes in terms of the racing element and can make a huge difference to a cars design. Undoubtedly Bridgestone would have adopted a different ethos when designing their Slick tyres, both different compounds and the tyres construction would differ from the ones used with their grooved tyres. The media are always quick to talk about the downforce being generated by the cars most likely as they feel this is quantifiable to the fans. The role the rubber plays however can be just as important as it too can have an effect on the aerodynamics and the downforce that can be generated. Understanding the tyres dynamics also helps to setup up the cars suspension which in turn can provide a performance advantage by decreasing wear life. In stark contrast to the established frontrunners the RB5's wheelbase was quite a margin longer which would have an impact on weight distribution, suspension setup and of course aerodynamics. 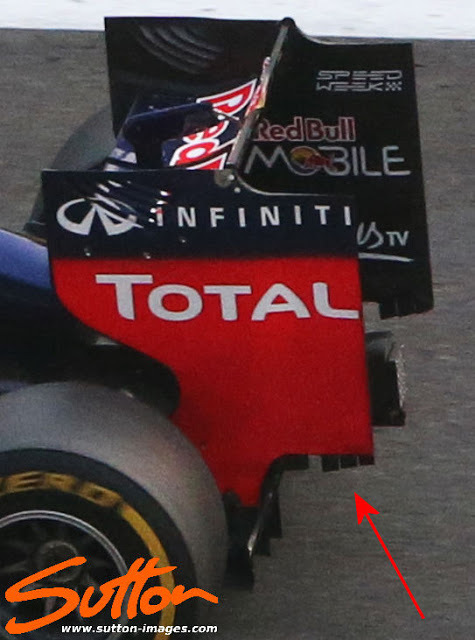 Whilst the other teams had utilised the DDD loophole in order to increase the height of the Diffuser Red Bull expanded the diffusers size by lengthening the area with the Rear Wing Endplates. As the team had plenty of space left either side of the Rear Wing Endpates (As their Diffuser didn't stretch to it's maximum permissible size) they attached footplates between the Endplate and the Wheel in order to create a lengthened vortex managing the effects of Tyre Squirt on the Diffuser. The original footplates from the Jerez test were simply flat but when the car arrived in Australia they had a distinct arc to them. Although the RB5 didn't feature it in it's launch spec by Melbourne the team had added a shark fin, unlike the fins that featured on the likes of the Renault R29 though the RB5's stretched all the way to the top flap of the rear wing connecting the two. Carried across from the last regulation set was the use of Wheel Covers, these help manage the airflow around the wheel. 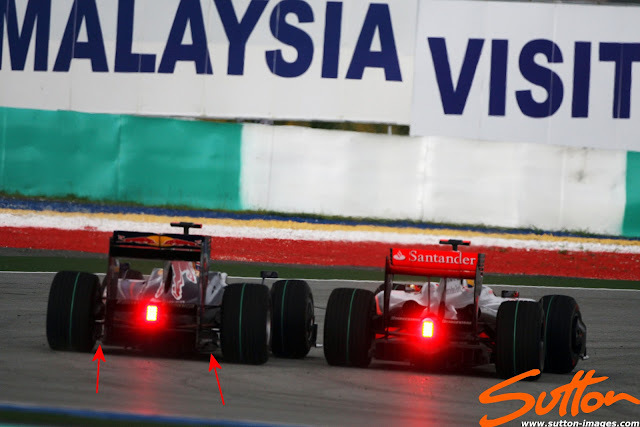 In Malaysia the team introduced a hole in the floor just in front of the rear tyre, this was placed here to create a vortex which in turn would aid in the Diffuser's efficiency. The RB5 originally featured mirrors on stalks that connected to the outside edge of the Sidepod in order to clear the usual space they occupied next to the cockpit for better airflow. Outboard mirrors as they became to be known had been a feature of the Ferrari F2009 since the start of the season and mounted the mirror directly to the Sidepod Airflow Conditioner. Red Bull followed suit in Barcelona further clearing the Sidepod of intrusions. 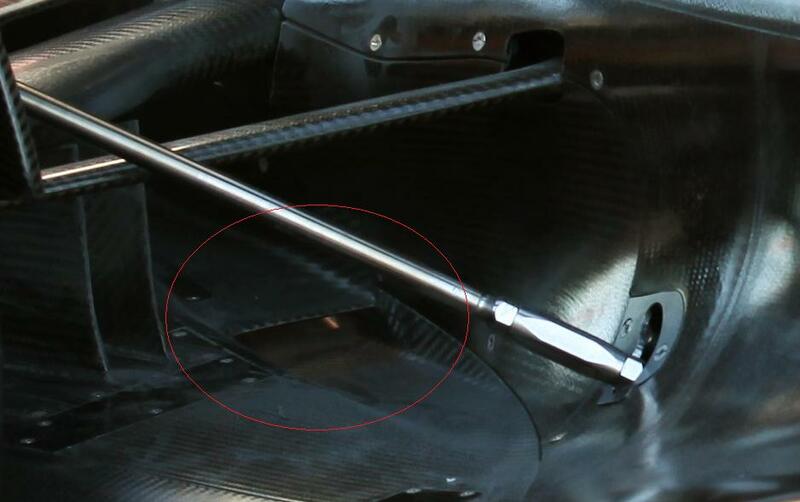 Furthermore in Barcelona the team added a hole in the central 15cm exclusion zone of the top flap this would allow for a steeper AoA making the wing more efficient. The team introduced their interim DDD at Round 6 in Monaco which featured the higher deck exiting either side of their low slung gearbox/crash structure. Above: The New DDD exited centrally above the main diffuser. Also very noteworthy in this picture is something that I think has often been overlooked in Newey's designs and that’s the halfshaft covers (Shroud). Here on the RB5 (Arrowed) they extend to cover the central portion of the Diffuser limiting the exhaust plumes influence on the Magnus Effect created by the halfshafts. 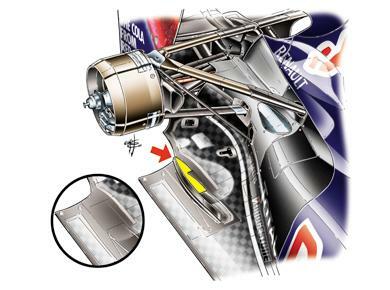 (A rotating part creates downforce which is fine if the airflow to the rotating object is continuous and laminar) The placement of the exhaust on the RB5 without this shroud would leave the halfshaft exposed to the inconsistent and erratic exhaust plume. 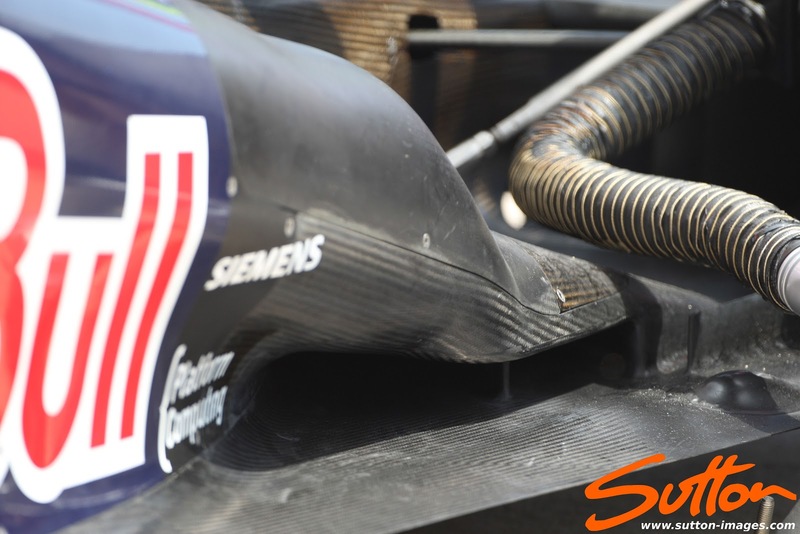 By placing this shroud over the halfshaft it isn't exposed to an inconsistent airflow pattern and so continues to provide a consistent level of downforce of it's own. The largest revisions however came 2 races later at Silverstone when the team introduced a new nose which was much wider than it's predecessor and placed the FOM camera's either side of the nose tip immediately bringing to mind the image of a Hammerhead Shark. The nose profile suddenly became the widest in the field and this change of ethos would change the aero further downstream (The team did continue to use the slimmer nose at several GP afterward). To tie in with this change at the front of the car the team revised the rear layout reducing the height of the Rear Wing Endplates and increasing the width of the diffuser. 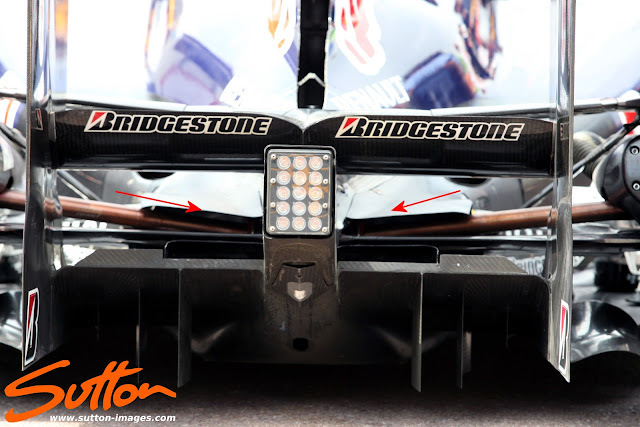 An expanded central section in the centre of the Diffuser helped to maximise the DDD effect with the RB5's configuration. 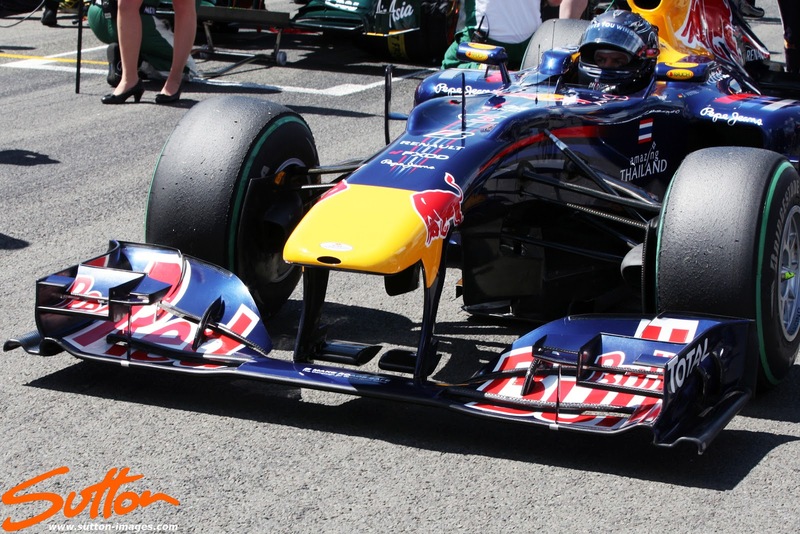 The Front Wing of the RB5 changed frequently throughout 2009 but a significant change came in Spa when the team adopted the type of Cascades that we still see on the cars up and down the grid today. 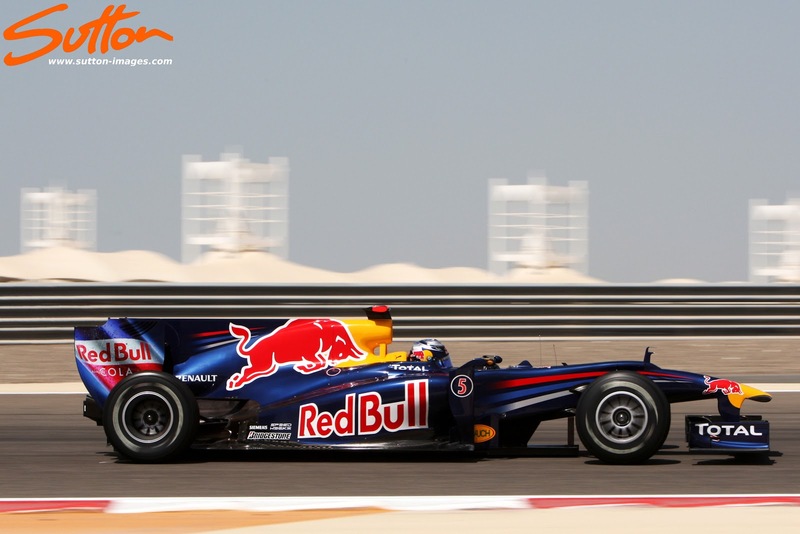 For 2009 the Toro Rosso team fielded the Sebastians of Buemi and Bourdais the latter however made way for Jaime Alguersuari from Hungary onwards. 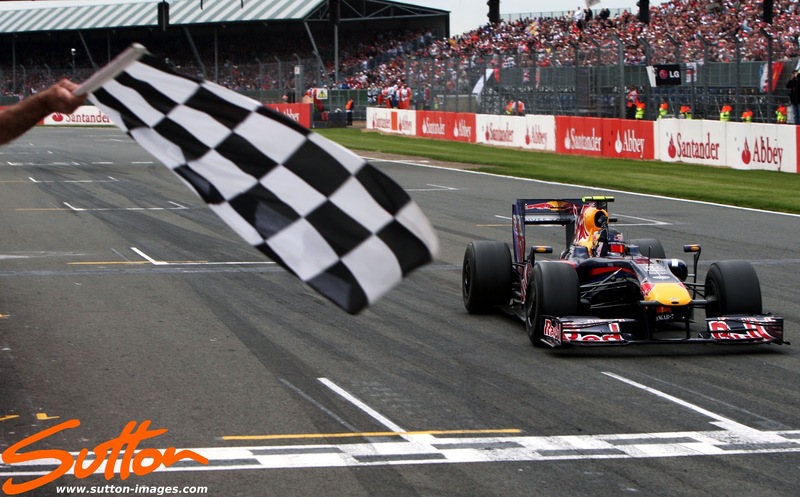 2009 provided the backdrop to an uninspiring season from the Red Bull B team with only 6 points finishes leaving the team at the bottom of the Constructors table. The STR4 was essentially a RB5 but failed to come even close to the performance of it's Renault powered sibling. Although on the face of it the cars didn't seem distinctively different for 2010 there were some fairly large design considerations to take into account. Firstly re-fueling was banned and so the cars would need to carry enough fuel to complete the whole race. This would have an effect on both the balance and wheelbase of the cars. Wheel Covers that had now become complex aerodynamic devices were banned and in an effort to reduce grip levels following the switch to Slick tyres in 2009 the Front Tyres were reduced in width from 270mm to 245mm. 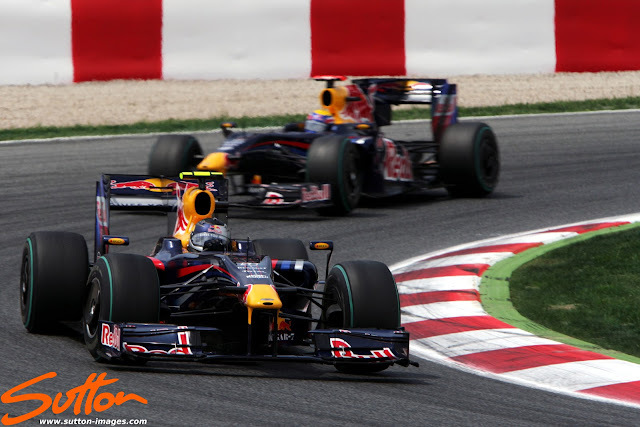 Renault were allowed dispensation by the FIA/Teams to work on their engine to bring it inline with the competition something that proved vital in Red Bull's progress. 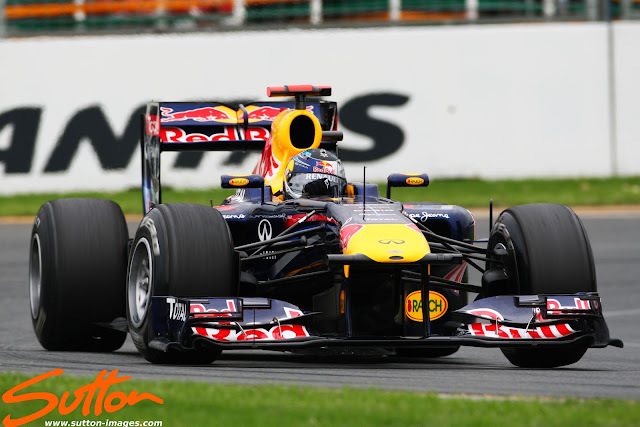 KERS proved somewhat of a damp squib in 2009 with both Brawn & Red Bull not opting to use it throughout the season even though the cars had been designed with it in mind. With 3 new teams entering the sport the teams took the decision not to run the system at all in 2010 but refine the concept for it's reintroduction in 2011. After the controversy of 2009 the teams were allowed to continue usage of the DDD's with a ban coming into effect in 2011. This allowed all the teams to fully commit to this design path for 2010 with Red Bull opting to not only use the space above as a secondary deck for the diffuser but also feeding it with airflow from the Sidepods / Radiators. The design team raised the Gearbox / Crash Structure on the RB6 to allow for a much cleaner airflow path for their DDD. Above: On the underside of the car the RB6 featured a much larger entrance to their second deck than any of the other teams. Several developments arose during the early stages of 2010 with Red Bull triggering the development path of one of these with their Exhaust Blown Diffuser. 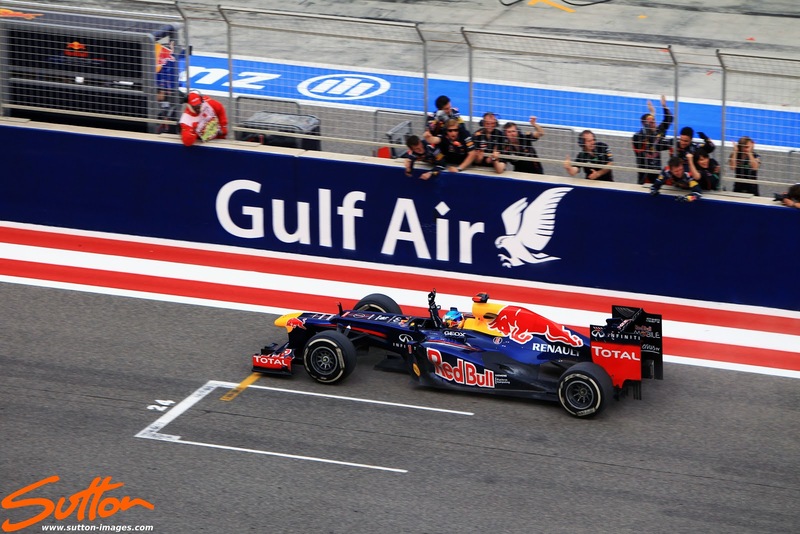 The team tested with a similar configuration used on the RB5 but when the teams arrived in Bahrain Red Bull had another exhaust up their sleeves. The RB6's exhaust now lay to the bottom rear of the Sidepod and would send it's exhaust gasses between the edge of the floor and tyre. This would create a spiral effect which would seal the diffuser at it extremities allowing for a much more productive Diffuser. Once again this allowed Newey to shroud the inner part of the halfshafts removing them from the inconsistent exhaust plume. With the central portion of the Diffuser isolated a window was opened up in the outer section of the diffuser in order to extract more performance from the exhausts energy. 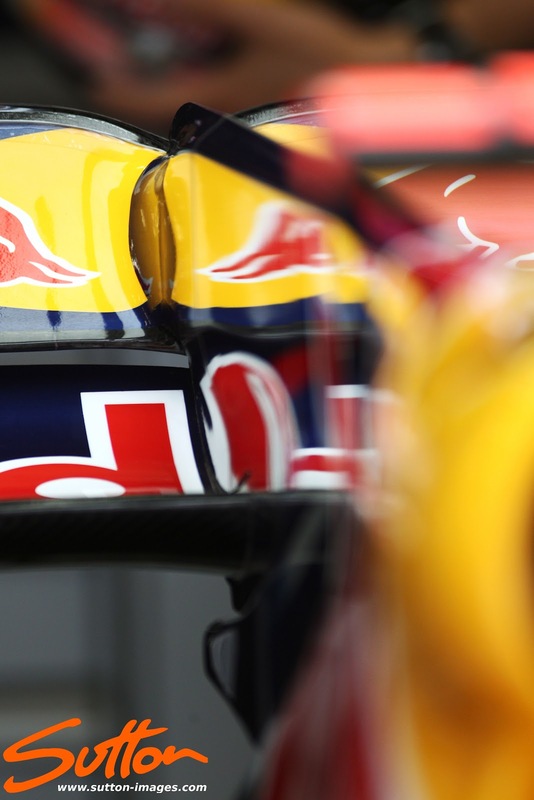 Furthermore Red Bull used Off Throttle Blowing during qualifying in order to extract more performance. Off throttle blowing enables a more consistent exhaust plume, as the driver comes off the throttle the engine map retards the ignition and with the exhaust valve open the explosion happens in the exhaust rather than being used to drive the piston down. This is known as Hot blowing and can over a sustained time frame be detrimental to engine performance. All in all the driver gets more downforce when he needs it in the corners. 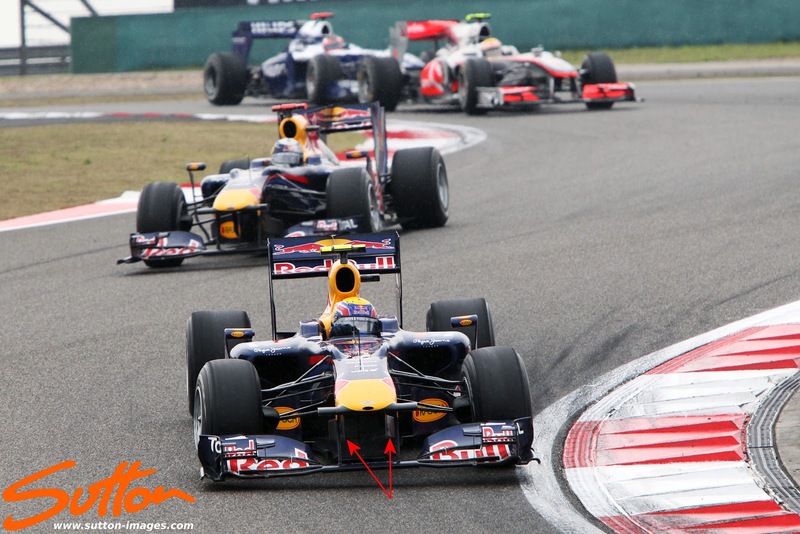 Above: In China the team introduced under nose Turning Vanes, these L shaped appendages would help to manage the airflow under the central portion of the car and deter any errant airflow from the wheels to impinge on it. The other device that had caused a stir when McLaren started testing was their RW80 or F-Duct as the mainstream media coined it. The device reduced drag on the Rear Wing by Stalling the plane it was attached to but was controversial due the need of the driver to cover a hole in the cockpit. It's integration into the other cars would be a long winded process as they set about routing the pipework through the car. Sauber were the quickest off the mark with their own version being ready for Round 2 at Melbourne, Red Bull first tested their own iteration in Turkey but didn't race it. The team also introduced a new Front Wing in Turkey featuring a hole in the Endplate that would allow air to move between the two sides, but just like the F-Duct this was only used in Practice as they reverted to the old specification for the race and qually. It's clear to see why Mark would be so frustrated as the senior driver up until Silverstone he was only 12 points adrift of his German counterpart and both still within touching distance of the 2 McLaren drivers. Above: The controversial Front Wing featuring 2 Endplate holes and the placement of the FOM carmera's to the lower position between the wing pylons. As the season moved on it became obvious that Red Bull had devised a way in which to make the Front Wing flex whilst still passing the FIA's load tests. 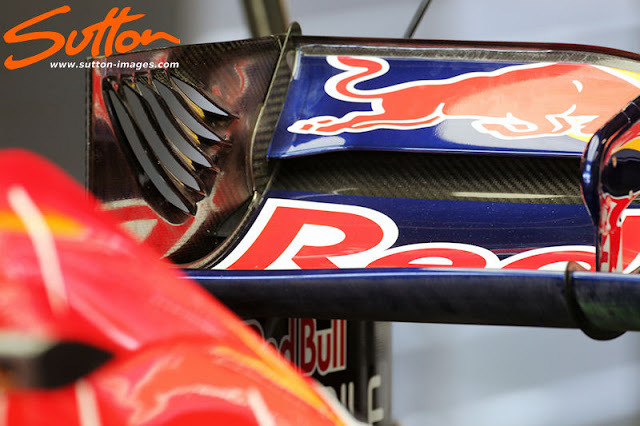 This flexibilty allowed the tips of the wing to flex down toward the track, of course all wings flex but Red Bull had used techniques they had been honing in order to circumnavigate the FIA load tests. 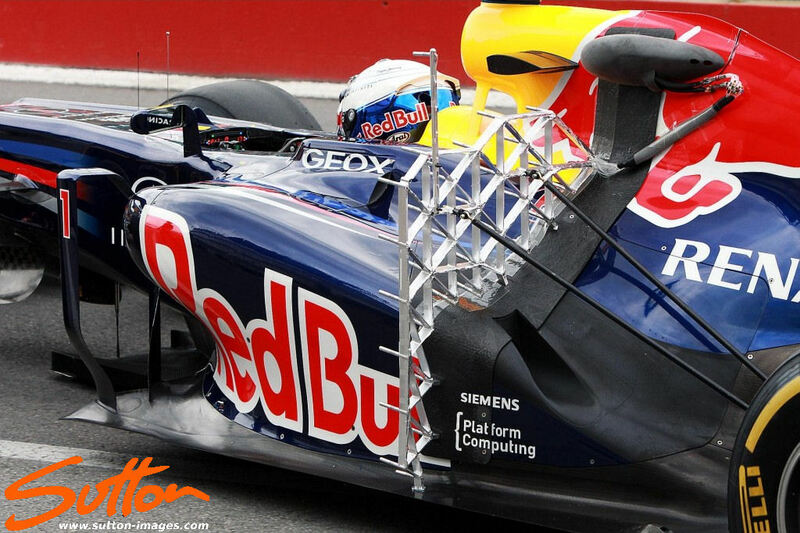 The tests carried out initially in 2010 saw a 50KG force applied to the Endplate allowing a 10mm flexing tolerance. 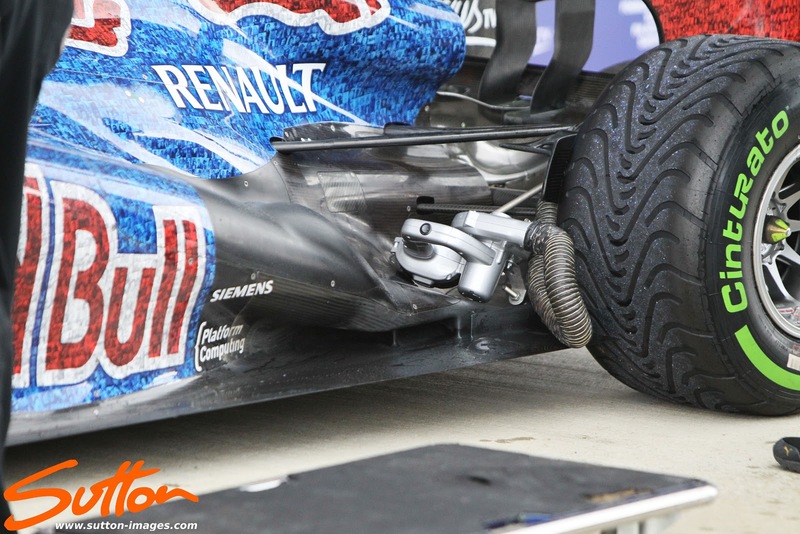 The FIA altered this from the Belgium GP to 100KG of force with a 20mm tolerance. The flexing Front Wings became an area for the other teams to chase with Ferrari perhaps sticking in the memory for their 'fluttering' wings. The principal behind the flexibility was to change the characteristics of the Wing creating a skirt as the cascade droops to the ground. Above: In Singapore the team introduced a new F-Duct system utilising the mainplane rather than the top flap. Combined with this they returned to using a hole in 15cm central portion of the top flap to aid efficiency. Adrian also inspects the effects of the New Beam Wing configuration being used with flo-viz indicating it's effectiveness. The team took 9 victories in 2010 and with a further 11 trips to the podium the team clinched the Constructors title at Brazil where the team completed a 1-2 finish creating an insurmountable lead. 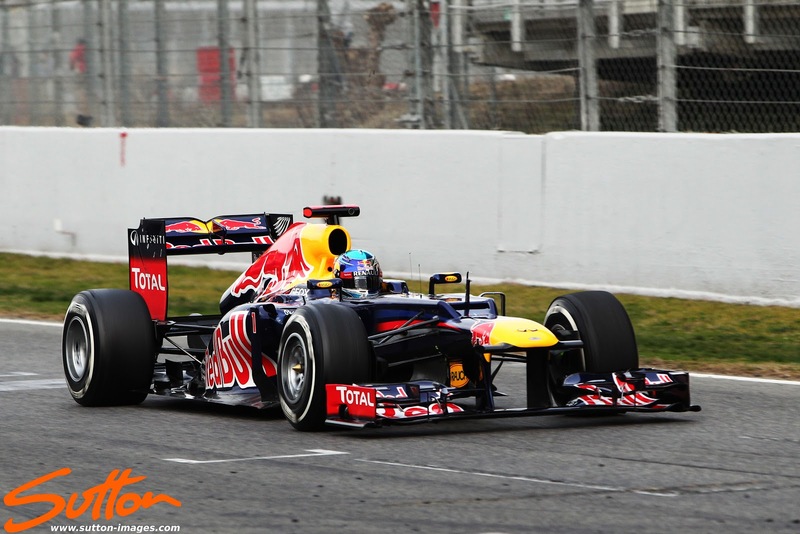 Meanwhile the driver's title was a hard fought battle between the two Red Bull drivers and Ferrari's Fernando Alonso. 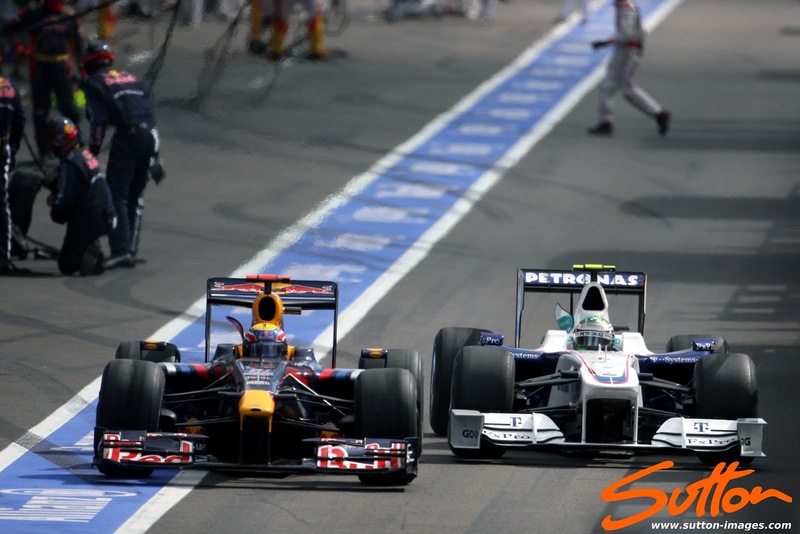 The Driver's title went to the last race in Abu Dhabi where Sebastian crowned a great season finishing 1st. A frustrated Alonso finished in 7th having spent a large proportion of the race behind the Renault of Petrov awarding Sebastian the title by just 4 points. 2010 marked the first time since Red Bull had taken ownership of the Toro Rosso team that it must design and build it's own car. The teams facilities in Italy took care of the build of the car whilst the Wind Tunnel facilities the team also owned in Bicester (Left over from the Jaguar purchase) were also put to use. At this juncture I believe Red Bull and Toro Rosso's histories fail to align and so I won't cover their progress here on in. 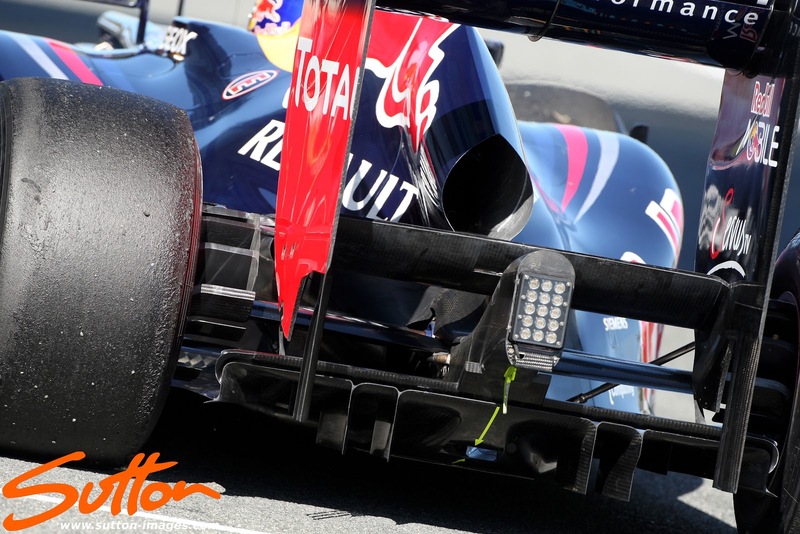 2011 saw the teams adjusting to more regulation changes with the proposed banning of DDD's (Double Decked Diffuser') being implemented with Diffuser height being shrunk from a maximum of 175mm to 125mm. The F Duct that was pioneered by McLaren and copied by most of the field throughout 2010 was outlawed but having seen the potential for reducing drag at the rear wing the FIA ushered in DRS (Drag Reduction System). The new system allowed the driver to change the angle of the Rear Wings top flap in order to shed the drag induced by the wing. It's use would be unlimited during Free Practice and Qualifying but could only be used in certain zones throughout the race. 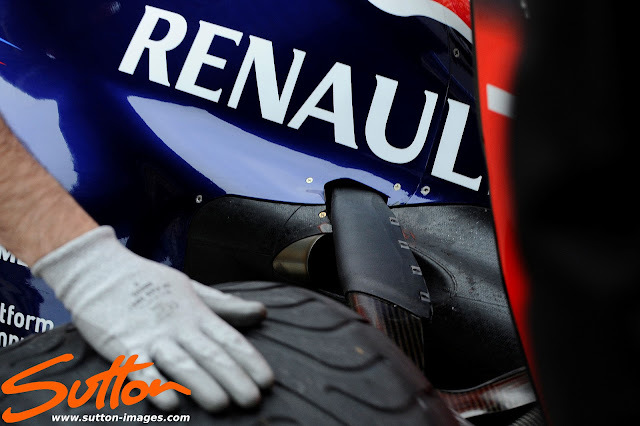 Bridgestone withdrew from F1 at the end of 2010 which made way for Pirelli to join the fray. Pirelli promised a much more aggressive approach to tyre selections than it's predecessor which in turn should have led to better racing. To assist Pirelli the FIA also mandated the Weight Distribution of the 2011 challengers. 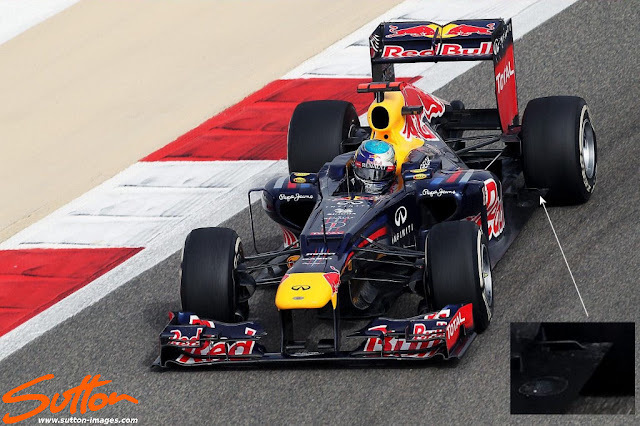 KERS (Kinetic Energy Recovery Systems) also made a return to F1 with the technology having been worked on by the teams and engine manufacturers throughout 2010. The FIA grew weary of the teams pursuit of exhaust gas manipulation via engine mapping quite early into the 2011 season and moved to ban it's use. After much too-ing and frowing with the teams, engine manufacturers and FIA the ban was lifted for 2011. 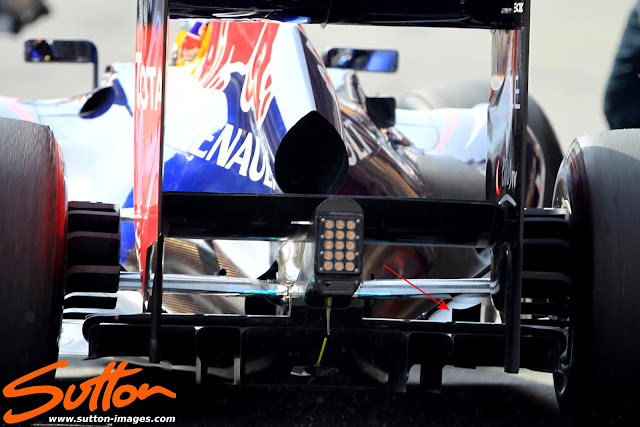 At the front of the car the team returned to the Hammerhead layout with the FOM cameras either side of the nose tip. Effort was still being placed on finding ways to flex the front wing even with more restrictive load tests. Strategy had become less important throughout 2010 due to the lack of refuelling and lack of hard tyre choices by Bridgestone. This changed for 2011 with Pirelli's entrance to the sport increasing tyre degradation levels and requiring both the drivers and teams to react differently. Red Bull's superior downforce levels compared to the rest of the field didn't mean they had less of a challenge with the tyres just a different scale. Red Bull did however push their luck a little too far in Spa when they blistered their tyres in qualifying. Red Bull asked that they be allowed to run with a new set of tyres at the start of the race but the FIA declined as Pirelli had been recommending maximum camber with which to run and the team had ignored. 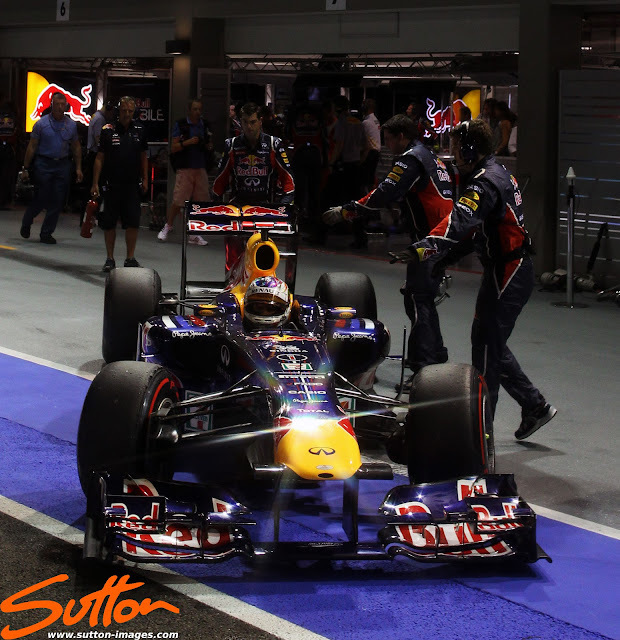 The team had KERS onboard for the first race in Melbourne (having not used it throughout 2009) but due to reliability issues they decided not to use it until Malaysia. It didn't stop Sebastian taking the first victory of the year though. 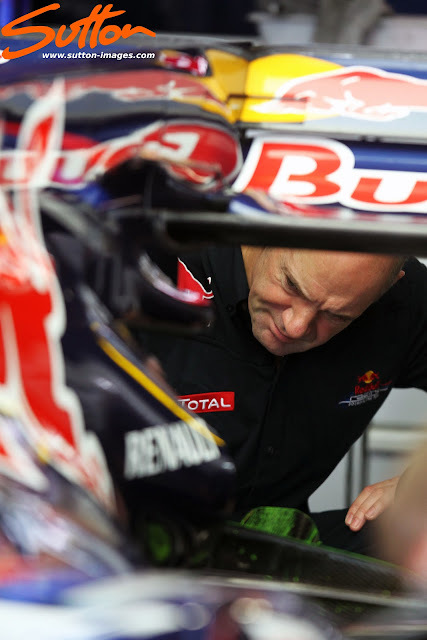 KERS continued to be Red Bull's Achilles heel with Newey even remarking that he'd prefer not to run it, which obviously stems from his clear favour of aero. KERS compromises the aero package due to both it's physical properties and cooling requirements both of which disturb Adrian. Even with lingering KERS problems the team were dominant with Sebastian finishing on the podium in all but two races (4th in Germany and a DNF in Abu Dhabi) taking both titles again and completing the double, double. 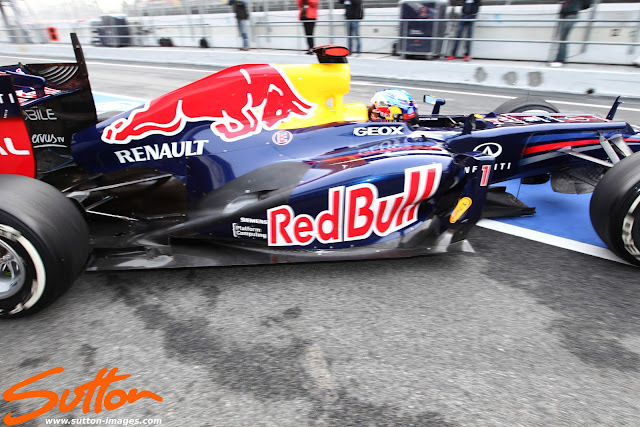 The RB8 was another evolution of the RB5 concept, refinements came in the form of 2012's controversial Step Nose and Sidepod Airflow Conditioners that now arched to meet the top of the Sidepod. 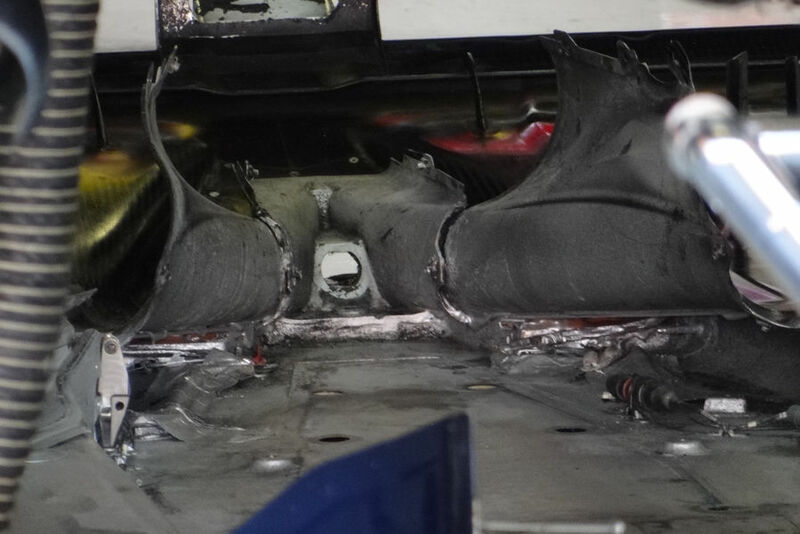 In the case of the RB8's step nose the team had used the area as for driver cooling taking an advantage of an area that would otherwise impact on the airflow over the top of the cockpit. Red Bull had been at the cutting edge over the last few seasons utilisng Exhaust positioning and clever engine mapping in order to enhance their aerodynamics. The technical regulations for 2012 would however put pay to this progress with the exhausts now required to exit atop of the Sidepods. 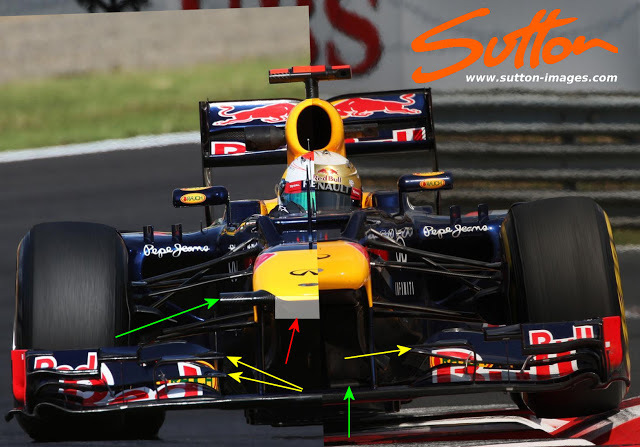 The Red Bull team had reportedly spent some of their development time chasing a method of re-ingesting the exhaust gases above the central portion of the Diffuser which would lead to nearly the same levels of downfroce seen in 2010/11. 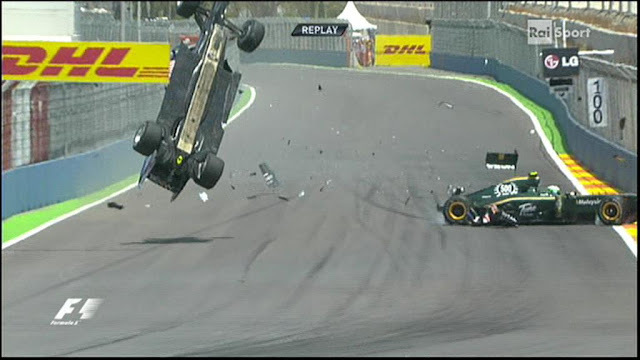 The FIA duly outlawed the design before it even hit the tarmac leaving the team to redesign their 2012 challenger. When the teams arrived at testing it was clear that several options had been pursued but as usual the Red Bull design team were not showing their hand early on when they arrived in Jerez with an exhaust reminiscent of the RB5's placed just under the upper wishbone. Once again the team were intent on removing the Magnus effect and it's interaction with the exhaust plume and so the RB8 featured a full length halfshaft shroud. 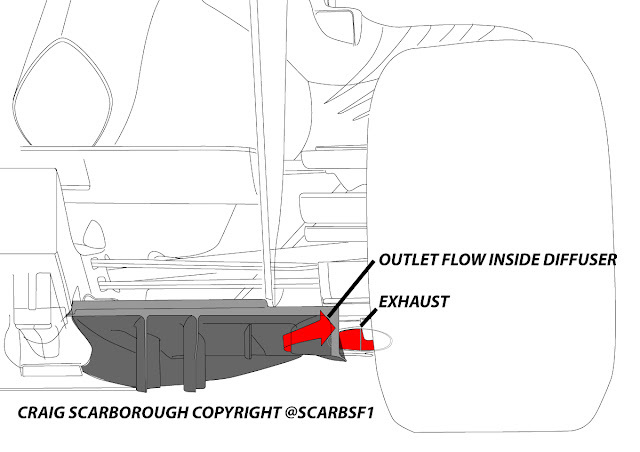 This could be seen at the Jerez and was an indication that the exhaust featured above was a Red-Herring. When the team arrived at the final test in Barcelona the RB8 sported a new rear end with the exhaust placed extremely far forward on the Sidepod in a ramped configuration. The exhausts positioning would utilise the airflow downwashing over the Sidepod sending it over the top of the diffuser and into the gap between the floor and tyres that the EBD's of 2010/11 had previously done. 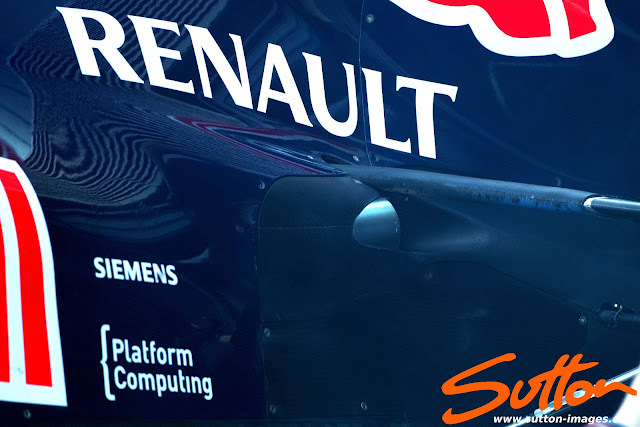 The ramp used on the RB8 also prohibited the flow from around the Sidepod interacting with the exhaust plume in a way which would be detrimental but this is where the team pushed the regulations further. 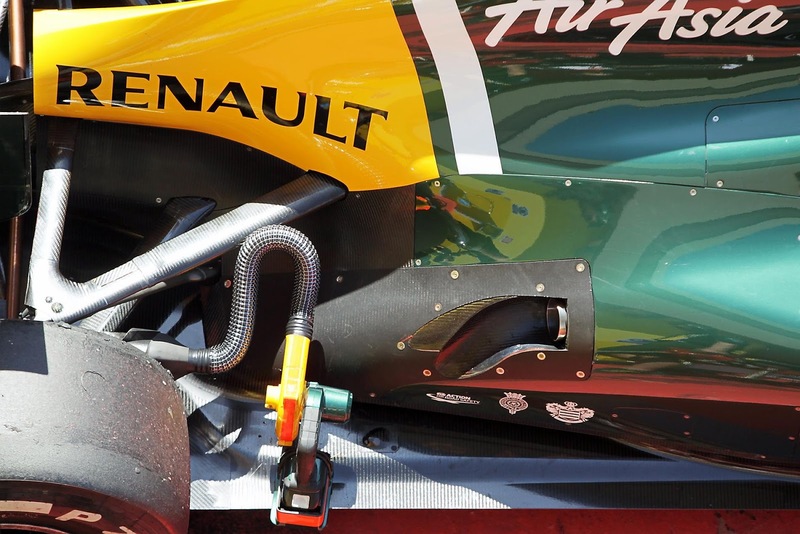 A Tunnel toward the rear of the Sidepods ramp allowed air to migrate underneath the ramp and exit into the exhaust plumes natural flow. Above: The RB8's configuration in the last Barcelona test as we can see the tunnel exits just infront of the pull rod into the exhausts flow. 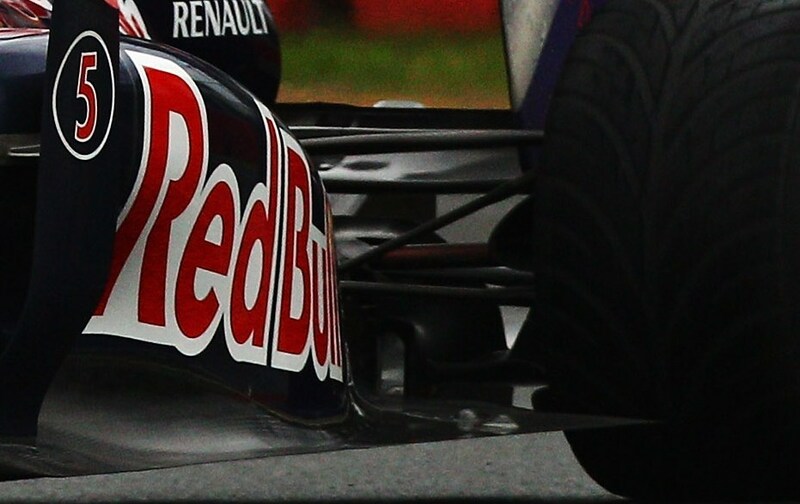 Above: Added to the RB8 with the new exhaust iteration was 2 floor mounted strakes underneath the shrouded halfshafts. These were placed here to guide the airflow as it passed over the region. The RB8's exhaust solution was complicated and although CFD and Wind Tunnel had clearly simulated it's merits on track the drivers complained of inconsistencies. 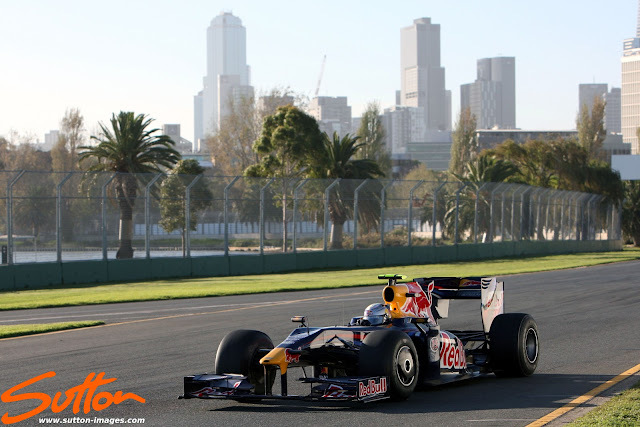 This didn't stop the team from taking 2nd and 4th for Seb and Mark respectively in Melbourne. 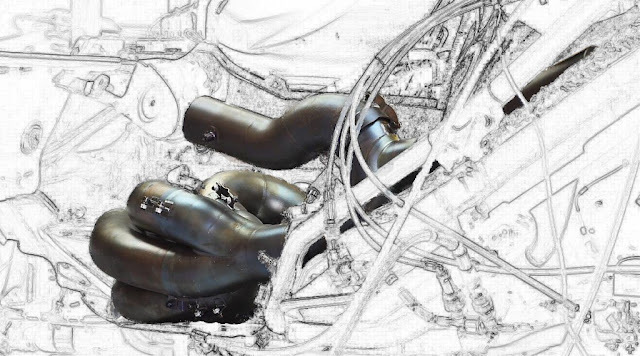 The team revised the exhaust channel for Malaysia opting for a more square edged channel which would change the way in which the exhaust plume interacted with the surrounding airflow. But whilst Mark continued in the same vein with another 4th place Sebastian languished outside the points in 11th having collided with Karthikeyan whilst he had been placed 4th. 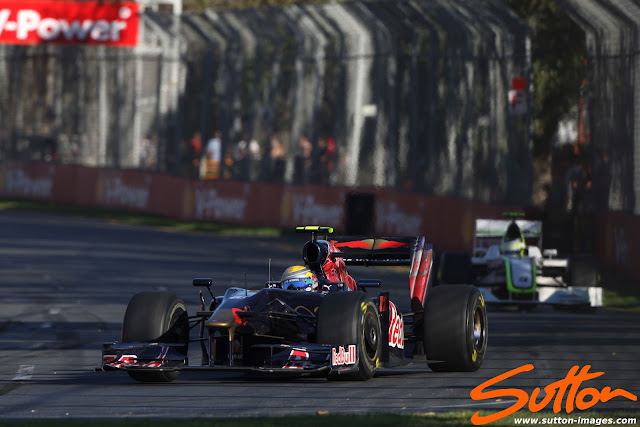 At this part of the season, Webber was genuinely able to get more from the car's exhaust-blown diffuser. In its initial form, this component required a very specific driving technique to maximise the time on open throttle - which increased the downforce boost from the exhaust plume - and Webber was superb at it, consistently squeezing just that little bit more from it than his team-mate. Vettel continued to be better at living with a little bit of entry oversteer, and that ability to adapt to the car moving around him was maybe partly why he was not as insistent on adapting his technique to a feature that calmed the rear end as soon as you got on the throttle. From Valencia onwards however, the Renault engine was running software that retarded the ignition off-throttle, using the extra heat created to maintain exhaust flow to the diffuser even off-throttle. Suddenly that downforce boost was there even during braking and Webber's specialised technique was no longer required. That improvement, in other words, took away a key Webber advantage. Above: Sebastian ran the exhaust configuration seen in pre-season testing at China, the exhaust is placed toward the rear of the car just below the suspension arm using this as a deflection tool to push air downstream. This configuration (due to the exhaust layout) has a much longer sidepod region which means the airflow has to travel much further down the car before it interacts with the exhaust airflow. Having the exhaust in this position is much more neutral and will give a less ‘twitchy’ car however net rear downforce could suffer. 3rd time lucky? At Bahrain the team introduced their 3rd exhaust solution of 2012 which had the tunnel closed off. This design was the same as the one on the Sauber C31 and removed the inconsistencies that the tunnel was creating both off throttle and in yaw. The team also adopted a similar solution being implemented on the Sauber in front of the rear wheels with a duct next to the vertical strake. The idea behind these are to reduce Tyre Squirt which is an unwanted aerodynamic effect of the rotating wheel/tyre. 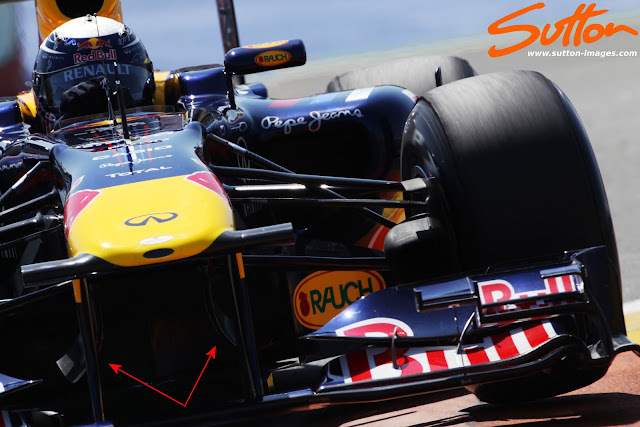 As the air dissapates from the wheel/tyre it is sent laterally into the diffuser's flow disrupting downforce. The holes/slots manage the airflow coming off the wheel/tyre and reduce the effects of squirt. In Barcelona the team returned to using the cross-under tunnel Sidepod but this time the tunnel had been extended and instead of releasing the airflow into the exhaust plume it would now be funnelled and released through the engine cover and out the back of the car. By this stage the team had added more control fins under the halfshaft shrouds with 2 now either side of the car. 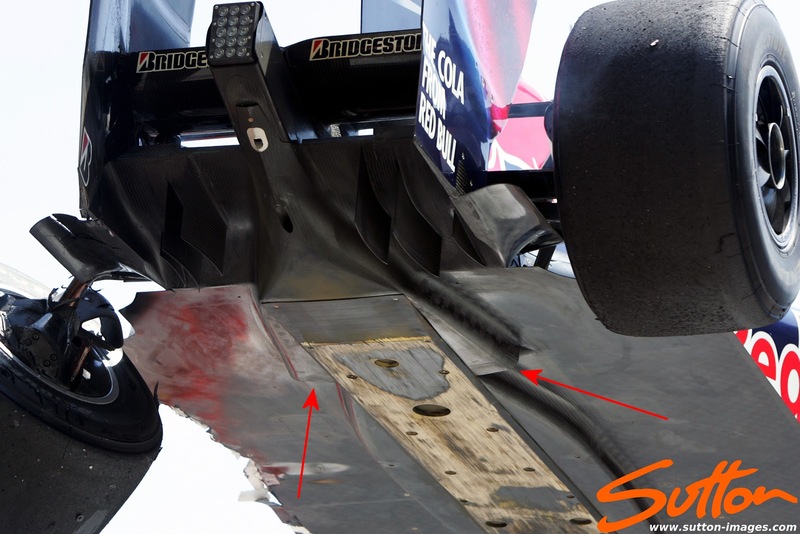 Furthermore a re-ingestion hole had appeared in the floor of the RB8 aft of the pull rod aiding flow to the central portion of the car. 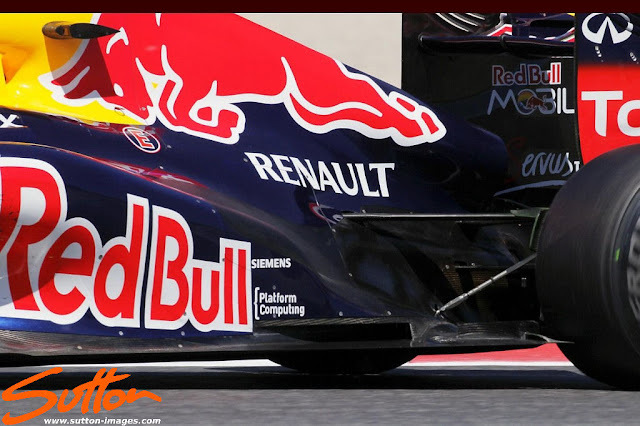 As the Red Bull style duct was outlawed the team went to Canada with their ramped style exhaust that didn't feature the cross-under tunnel but ever eager to understand and learn the team used a rather impressive Pitot Tube array on the car during the Free Practice sessions. Having taken pole in Montreal I remarked at the time I believed Sebastian had taken too much from the tyres. This proved to be the case and his race result was further compromised when the team tried to eek out his stints demoting him to 4th as both Grosjean and Perez passed the German on fresher rubber. A two week break after Montreal and the return to Europe in Valencia awaited the teams, Red Bull had been busy back at the factory and arrived with what could have been classified as a B-Spec car. 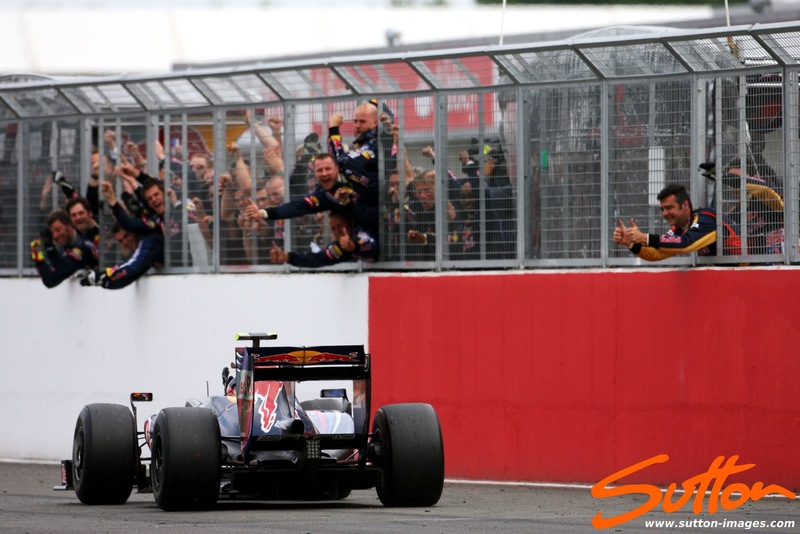 The RB8 now featured a expanded version of the cross-under tunnel with which 2 entrance/exits were in use. Vortex Generators had been added to the top of the Sidepod in order to further enhance the 'downwash' that lead to the exhaust channel. Another pair of vertical floor strakes were added under the halfshaft shrouds (now with 3 either side) to groom the airflow. The pace of the Red Bull's in Valencia was quite frightening when compared to that of it's rivals with Mark's pace disguised by his lowly starting position of 19th. He finished the race in 4th but his team mate failed to finish due to an alternator failure, a gremlin that would also force the Renault powered car of Grosjean's to a DNF. Above: For Silverstone the team revised the channel around the exhaust creating a hump in order to encase the airflow. 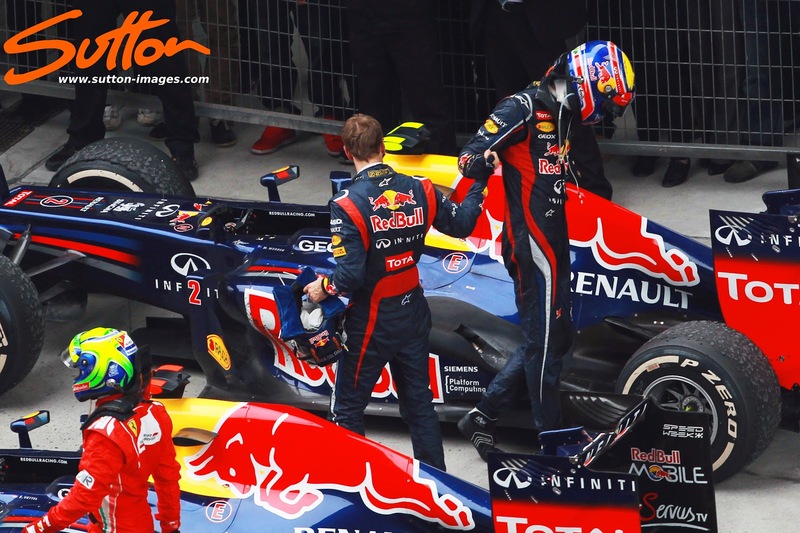 “The stewards received a report from the FIA Technical Delegate, along with specific ECU data from Red Bull Racing Cars 1 and 2. The Stewards met with the team representatives and the representative of the engine supplier Renault. Effectively the stewards were saying that although Red Bull were breaking the rules per-se the way in which the rules had been written still allowed what Red Bull were doing. This led the FIA to ratify the rules after the GP requiring a torque map to be selected by each team from the first 5 races of the season and giving a target % to work within that map. Essentially the map used by Red Bull in Hockenheim limited the torque available to the driver by offsetting the pedal position to the power being produced. This aided in both increased drivability and a more continuous exhaust airflow allowing the exhaust gasses to provide aerodynamic advantage even when the driver was curtailing his throttle usage. This didn't adversely effect Red Bull who went on to score good points up until Monza where the curse of the Renault alternator struck Sebastian Vettel again giving him another DNF. Singapore represented another fairly large shift for Red Bull with another package of upgrades they flew out a new Nosecone/Front Wing which represents a change in philosophy, the Top Flap now separates into two sections making the Wing 4 tiers as opposed to 3. The tips of the Top Flap in combination with the R Cascade in front of it are designed to vorticise the airflow leading to a more energised flow being dispatched along the car. In Tandem with these Front Wing changes the team also revised the nosecone of the RB8 utilising a 'Pelican' style underbelly to the nose whilst extending the tip of the nose and also placing the FOM Camera's into a more forward and lower position. 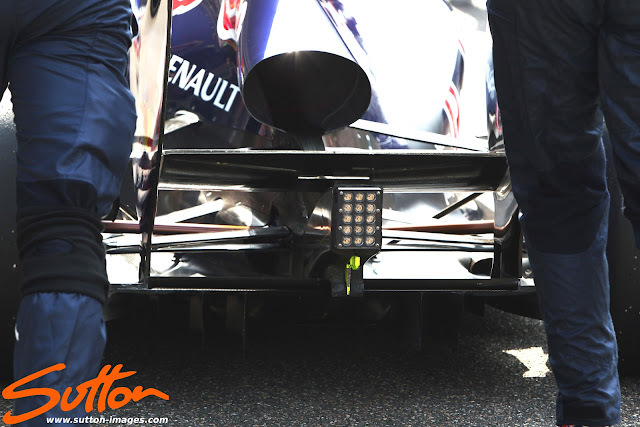 Red Bull have adopted the hammerhead camera placement since Belgium tidying up the area between the Front Wing Pylons and allowed for the introduction of the Tilting or Rotating Wing and 'Pelican' underbelly. Like most teams Red Bull originally used the camera's in a position behind the central section of the Front Wing to attenuate the airflow's characteristics. This is important as the central portion of the Wing is an area subject to specific rulings set out by the FIA in order to the limit the amount of downforce/effect generated here however with a Lower Nose tip and 'Pelican' underbelly the effect has been altered higher up. Red Bull's early adoption of a longer wheelbase with the RB5 helped with the transition from the re-fueling of 09 to the full tanks of 10. Their understanding of the slick tyres also provided the team with a great platform on which to work but it was their unwavering will to push the boundaries of both the technical regulations and implementation and marriage of new and old technologies in combination in order to extract more performance from their cars that has ultimately made them a force to be reckoned with. A superb infrastructure in terms of both staff and facilities sets the team in good stead for the future and with a stable rule set for 2013 I see no reason why the team won't once again be challenging for both titles. I very much agree .. great workup. Will 2013 show more RB innovation? I look forward to finding out ..